An achievement boot with style! 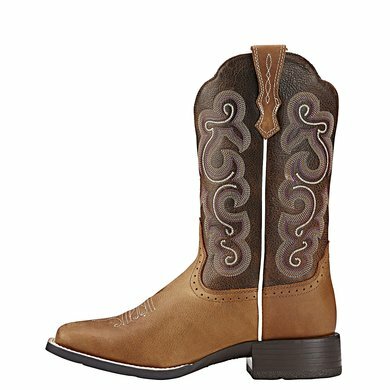 With high-quality full grain leather on the bottom and top, the Quickdraw features the ATS® technology, leather upholstery, stitch patterns with embroidery and a Duratread outsole for durability. Combined with jeans or a denim skirt ensures that the cowgirl outfit is complete! 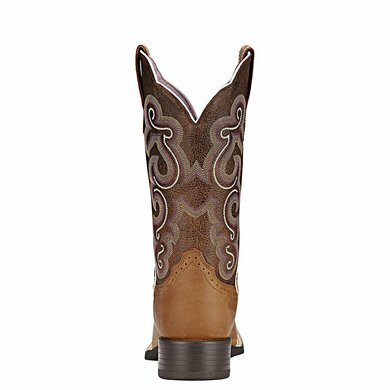 You do not need to walk in these boots. Suitable for all day driving, driving and for a (western) occasion. Also very suitable for competitions. Super boots, but almost 2 months delivery time. That was the last time I ordered here. ordered on the last Tuesday and still not arrived .. 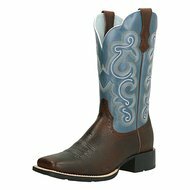 Very nice boots and as always with Ariat it fits perfectly, I even walked through the forest. The color looks more like the turqouise than in real life, in reality it is more blue jeans and colors very nicely with the dark brown. Answer: The heel of this boot is about 3.8 cm high. 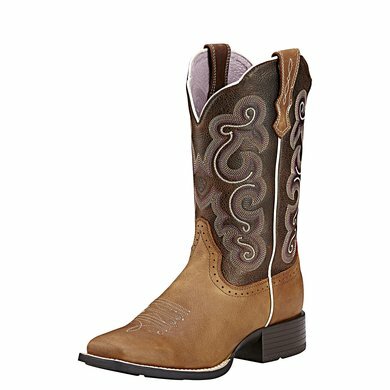 Question: Have the same model Ariat and would like to order, but I am uncertain with the size. In my boot is 8 1/2 B. What size do I have to select in your table?